Another one of my favourite cuisines to cook aside from Italian is Asian! I also love going out for this style of food and am often inspired by the flavours and dishes I try. A little bit of Sriracha, soya sauce, garlic, ginger and sesame oil can go a long way my friends! 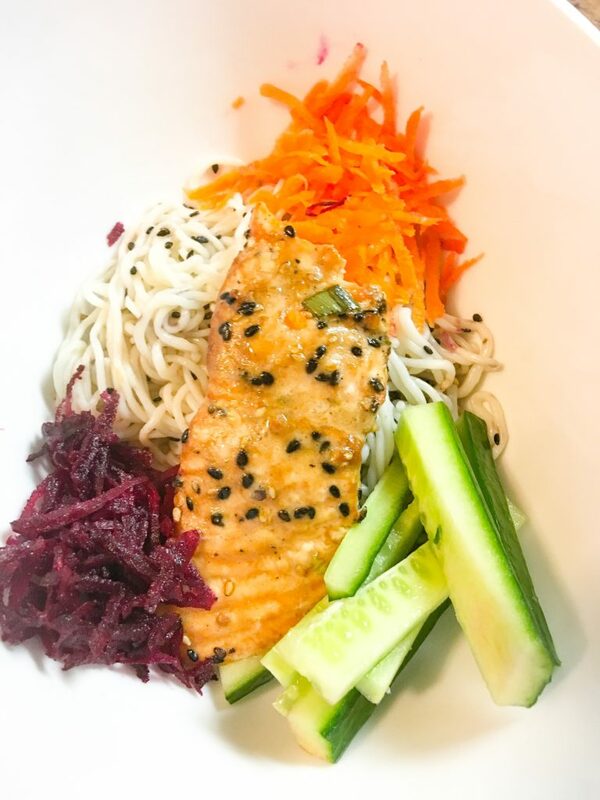 This is a new dish that I recently started making and it puts an Asian twist on salmon. Funny enough I really disliked salmon growing up – I think because it has a particularly ‘fishier’ taste, if that makes sense, compared to more mild fish like halibut, tilapia or cod. Anyways, as I get older I am finding that my taste buds are definitely changing and salmon is appealing more and more to my palate. BUT one reason I really like this recipe is because the Asian marinade is full of flavour so the salmon isn’t to overpowering. So for those of you new to cooking with Salmon this could be a good place to start! There are two parts to this recipe. One is the marinade for the fish and the other is a glaze that you put over top once the salmon is cooked. BUT I like the marinade on its own too- so the glaze is definitely optional. First: whisk the marinade ingredients all together in a bowl and then pour into a large ziploc bag. 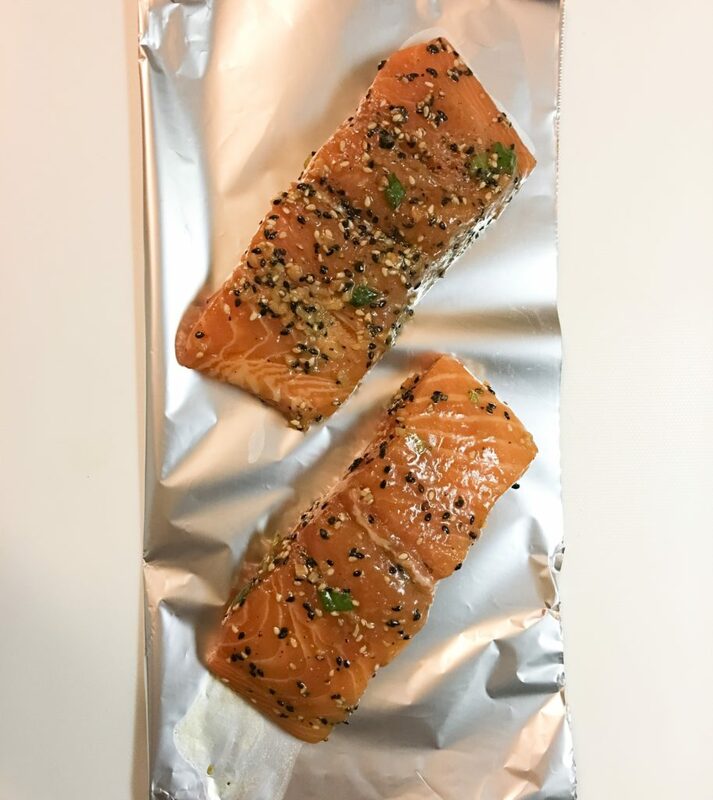 Place the salmon filets or steaks in the bag and lay flat in fridge for minimum half hour – for optimal flavour leave it in the fridge for 2-3 hours! Regardless of how long you marinade- flip the fish over at the half way point. 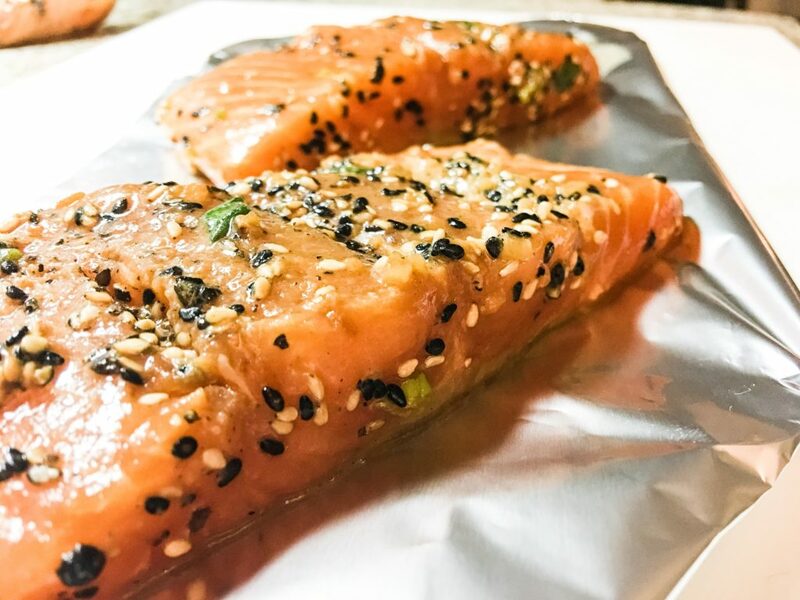 Once your salmon has been soaking in the yumminess for at least 30 mins you can preheat the oven to 400 F. Place a sheet of tin foil on your baking sheet and the filets on top (saves a mess). Alternatively you can cook them on the BBQ wrapped in a tin foil packet! Pop the salmon in the oven for about 20-30 mins. You’ll know it is ready when the salmon is flaky. While your salmon is cooking don’t forget to prep the glaze. Mix all of the ingredients until its a smooth glaze – the honey can take a bit of work. Drizzle over the fish once it comes out of the oven and garnish with leftover green onion and sesame seeds.